Providing you the best range of hepa terminal box with damper, powder filtration box with hepa filters, hepa filters and mini - pleats hepa filters with effective & timely delivery. We are manufacturer of Hepa Terminal Housing for AHUs and Cleair Air Area as per customers requirement with Hepa Filters , Damper, Dop testint port etc. We manufacturer Powder Filtration Box for machines as per customer's drawing and requirements with Hepa Filters for clean air release. As a pioneer name in the industry, we are offering a precision engineered array of HEPA Filters. These filters are instrumental in removing air suspended contaminants including dust, smoke, bacteria, etc. They are widely used in hospitals, laboratories, food processing units, aerospace, and pharmaceuticals industries. These filters are quality checked by our team of diligent professionals before delivering it to customers to ensure their flawless performance. Additionally, clients can avail these filters from us at affordable rated and within the promised time. 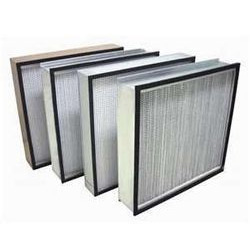 Application : HEPA filter have specially use in air handling unit, FBD M/c, Clean room, Clean room equipment, Hospital & other systems for final filteration. Media : Micro Glass Fiber Paper (imported). Construction : Flange or box type in aluminium / S. S. frame. Class : EU12, EU13, EU14 (Eurovent Std) / HI 2, H13, H14 (BSEN779 Std). We are a unique entity in the market, actively committed to offering an optimum quality range of Mini-Pleats HEPA Filters. 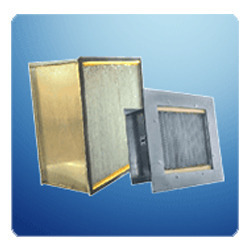 These filters provide extremely high purity filtration and are used in various industries. The offered product is fabricated using the latest technology and premium quality raw material to ensure high efficiency and long durability. They are valued among our patrons for its water resistant, fire retardant, and imported micro fine glass fibre media. We provide these filters to our clients at affordable price. Application - Mini-Pleats HEPA filters have specially use in air handling unit, FBD M/C, Clean room, Clean Room equipment, Hospital & other systems for final fileration. Media - Micro Glass Fiber Paper (imported). Construction - Flange or box type in aluminium / S.S. Frame. Micron - 99.97 - 99.99% Downto 0.3 micron.